Abstract Art Can Inspire and Influence Your Own Work » What's Under the Needle? In this the first Abstract Art class I wrote, the exploration covers the work of female abstract artists. Women were really in the lead when it came to the development of abstract art...you will learn about the many wonderful women artists that the critics of the time completely overlooked. You will learn how abstract art can inspire and influence your own work...there's such a good fit between abstract painting and quilts. We will also examine the beginnings of abstract art and what it meant to those making it. Then you will design some abstract quilts yourself. I will give step by step instructions, don’t worry! We'll continue by looking at geometric abstraction - this is very similar to the basis for many traditional quilt patterns. It will be interesting to see how painters addressed this same topic, and find out what we can learn from them. In Lesson Four, we are going to explode into color! Many people love to work just from color, so let’s see just how that is done. We are also going to take a look at how to use layers to create complex abstract designs. 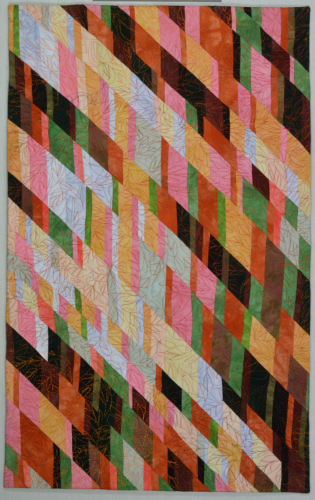 I will be walking you through the best way to use value and color in your quilts too. And the final lesson will cover construction, putting it all together, critiquing and finishing. How to choose which of your many designs? How to evaluate them. A simple way to choose fabrics for your quilt. Construction, quilting patterns that support rather than argue with your design and all the finishing touches.